Hamlet10 at the Flamboyán Theater. Photo: Martin Harris. The New York Shakespeare Exchange’s Hamlet10, now playing at the Flamboyan Theater, is at turns thunderous and muted, kinetic and still, giddily funny and icily grim. It is, in other words, much like any other production of Hamlet, save for the device alluded to in that title – the role of Hamlet is played not by one actor but by the company of ten, five men and five women who alternatingly don and disrobe the Prince of Danes. Sometimes the transition is clean, linear, a baton passed between scenes. On other occasions, particularly during those big soliloquies, Hamlet is a beach ball tossed line by line amongst the ensemble. It’s an intriguing, occasionally frustrating twist to an otherwise straightforward interpretation by director Ross Williams. The text is roughly as Shakespeare wrote and ordered it, and the stage is a crisp island of movable blocks, audience on all sides, that unfold and reorder as the scene demands. That title, by the by, translates aloud to “Hamlet to the tenth,” which we’ll have to excuse as poetic license; a single Hamlet raised to the tenth power, of course, would remain a single Hamlet. Promotional materials for Hamlet10 explain that the unifying device “will stress how aspects of Hamlet reside in us all,” which – no, really? – is a bit of a reductive sell. Hamlet is a literary character, literary characters exist in the minds of their readers, and the ones that survive longest tend to offer some inscrutable kernel of truth to all who encounter them. Hamlet10 ostensibly aims to complicate notions of gender, age and ethnicity in the play, but I’m not quite sure how this functions. 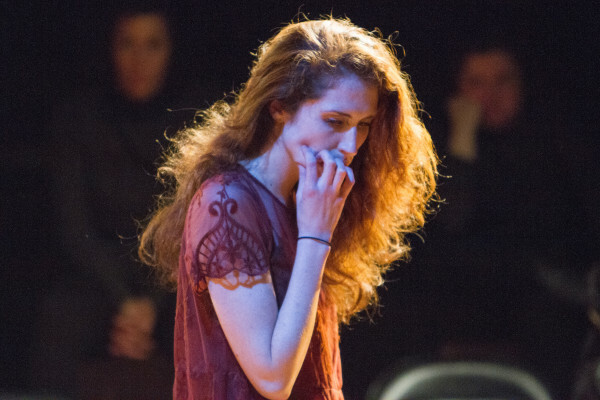 One of the most affecting scenes of the evening was Hamlet’s brutal turn against Ophelia – get thee to a nunnery! – in which instance he is portrayed by a woman, Elizabeth Neptune. It is interesting enough to consider the implications of one woman condemning another to a nunnery, and Neptune is a cold and devastating Hamlet. But the thought experiment is superficial, undermined by the basic dramatic conceit that actors play characters, and women often play Shakespeare’s men. As the text does not and cannot interrogate the sexual politics hinted at in the casting, and as Hamlet was played by a man moments ago and will again be played by a man moments later, the scene’s power comes from Shakespeare’s words and the (truly forceful) performances of Neptune and Rebeca Miller as Ophelia. Put more simply, the device is subsumed by the story. Dramatic narrative requires our acceptance that characters are characters and see each other as such. Since we have an implicit understanding that the diegetic Hamlet is a man, the “but what if he was a woman? ?” question doesn’t quite complicate our understanding of the play. Later, when Hamlet confronts Laertes at Ophelia’s grave, he is played by Miller. Surely we are meant to see some ghost of Ophelia in her onetime lover, but this again falls short of carrying any real emotional weight. As best I could tell, Laertes (a vengeful JC Vasquez) did not see what I saw, saw only the singular Hamlet he had seen in every previous actor, and the scene played out as you would expect, with Laertes angrily lunging at the man responsible for the deaths of his father and sister. If Hamlet’s many faces are invisible to his fellow Danes, how am I to lend them any weight? I don’t mean to diminish formal experimentation – Hamilton is proof that against-the-grain casting is a powerful means of exploring the identity politics in an well-known story. But in that case the content of the thing, American history told in hip-hop, is as subversive as the form. In Hamlet10, the formal experiment is at odds with the immutability of Shakespeare’s text. If there is power to the experiment of Hamlet10, and I do believe there is, it is musical rather than cerebral, experiential rather than intellectual. Williams stages many of Hamlet’s major speeches as inter-ensemble conversations, which is often confounding – as though Hamlet’s psyche is a sort of Jedi Council, or Gollum addressing his reflection – but has the grander effect of turning the company into a chorus, allowing intense crescendos and moments of unfettered chaos that shutter into chilling calm. Like colours in a painting, emotional beats in a play are typically more compelling when surrounded by their opposites; that nunnery scene I mentioned earlier may have fallen flat were not the preceding “To be or not to be” speech a loud and theatrical affair. And though certain actors offer less to Hamlet than others, the alternation of roles evokes a melody shared among instruments: listen to a flute long enough and nothing sounds more refreshing than a cello. I’ve already touched on Neptune, as well as Miller’s standout Ophelia, who descended into a wrenchingly quiet madness. Harry Barandes deserves mention for his sturdy, measured takes on Horatio and Hamlet; so does Sean Hinkle, a clownish Guildenstern and a snakelike Hamlet. Often I yearned for more than the brief turn afforded certain players. Kevin Brewer and Julia Watt made an excellent Claudius and Gertrude, yet both shone as Hamlet—especially Watt, who gave the prince a terrifying cruelty matched only by Neptune’s. And therein lies the greatest flaw in Hamlet10′s grand experiment: at a certain point the twist distracts from what it’s twisting, and we are left wondering not “What if she were Hamlet?” but “Wait! Can’t she be Hamlet for a little bit longer? Hamlet10 is on at the Flamboyán Theater until 9th April 2016. Click here for more details.